You know how some deniers beat up uncertainty every time climate change is mentioned. Well, there's a new booklet that's just been published, which will give you a heap of good tips on how to deal with the subject. Tell a human story not a scientific one. Managing expectations is about pointing out stuff like the fallacy that because something is not known for certain doesn't mean that nothing is known. For example, it is known that CO2 is a greenhouse gas and more of it heats up the planet. Starting with what you know means starting out with facts like the world is warming and climates are changing. And that heat waves and deluges are getting worse. Rather than starting out with whether or not the planet will heat up by 4C or more or whether we'll act and keep it to 3C or less. Shift from ‘uncertainty’ to ‘risk’ because most people don't understand what is meant by uncertainty when used in science. Most people know a bit about risk, though. People typically pay hundreds of dollars a year on insurance against events that have a much lower risk than climate change. You can read more examples in an article by one of the authors, Adam Corner, at Shaping Tomorrow's World. And the link to the handbook is below. Adam Corner, Stephan Lewandowsky, Mary Phillips and Olga Roberts (2015) The Uncertainty Handbook. Bristol: University of Bristol - download here. "Shift from ‘uncertainty’ to ‘risk’"
Shouldn't we be highlighting how the spectrum of possible outcomes is changing with time? In the 70s, when the science was less studied and we had far less CO2 in the air, we might have allowed a large range with some chance of minimal impact. But as time passes the chance of minimal impact is disappearing (or has already gone), the median position moves further into the range of catastrophic outcomes, and human extinction becomes increasingly possible. I still think 97% is more robust. Jim Powell did a lot of hard work to go through so many papers, and that 0.01% of papers explicitly reject the consensus in his sample of abstracts is believable. But I think he's wrong to extend that to a 99.9% consensus. In the Cook et al. paper in 2013 we asked scientists to rate their own papers as well as looking at the abstracts. They considered the full papers and this also came up with a consensus of about 97%. Sometimes papers that rejected the consensus weren't picked up by an abstract search, so I'm convinced that Jim Powell is wrong to assume that he found them all. But this approach did show that the abstract method seems to be unbiased in terms of calculating the consensus % so it's pretty robust. HOWEVER: Jim did look at more recent papers as well, and in the Cook study we found that the consensus has seemed to get stronger with time, reaching ~98% by 2011. We should be careful about comparing time periods since that can be important to your reported number. You are quite correct MarkR. The absolute percentage is irrelevant once it is above 95%. There is an element in the USA even among so called rational people that subscribe to NIH (Not Invented Here). I came across this phenomena of NIH quite a few times in my career. There are many examples of it in many fields. The Black Box Flight Recorder and the Microwave Landing System are two that come mind that were invented in Australia but were not made the world standard until the US got full control od both. They then acted as if they invented both. We could not get FDA approval for Relenza until they caught up with the 'me too' drug Tamiflu. The difference between Relenza and Tamiflu is that Relenza is based on a sugar ring and Tamiflu on a benzene ring. Both have identical side groups which give the drugs activity towards the Neuraminidase enzyme on the surface of the Flu virus. They only just evaded our patent by claiming it was a totally different molecule rather than a direct copy with a different scaffold. When I'm educating* people about climate change, I always mention the consensus, but I don't mention 97% -- I just refer to 'the vast majority'. If you give them a specific number (especially one with so much push back from those in denial) it gives people something to quibble about. I usually say "every scientific institution in the world" and then mention a few of them. If they then retort with a few names of people who are contrarians I usually know enough about those individuals to explain where their bias comes from and why they're wrong. I agree uncertainty is an issue but I always turn it quickly into a question of risk. My favourite risk line is, "if you fall off a ladder there might be uncertainties about which bones you'll break, but you know it'll bloody well hurt, and in a worse case scenario you'll be dead". "What they found was that if you just say "the majority of climate scientists agree", then it has no impact. People interpret "majority" in their own way - and usually way underestimate it (could be anything from 51% to 70% of scientists, far short of the actual 97% plus)." I don't always follow that myself. It depends on the context and who I'm talking with. I think John Cook found something similar. In casual conversation if you lead in with a question, asking what percentage of scientists agree, then when they reply 65% and you can show them that it's 97%, the 97% number is more likely to stick and resonate. Or so the research shows. Jim Powell was actually one of the originators of the consensus research that Cook et al published. He left before Mark or I got involved in it. I think Jim goes too far in setting a very strict, explicit standard for what constitutes rejection. 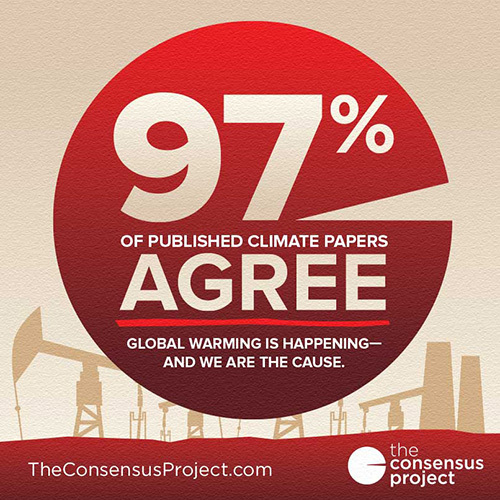 There really are around 2-3% of papers that reject the consensus, explicitly or implicitly. This comes not just from the ratings of the abstracts that we did, but also the ratings of the whole papers done by the authors themselves. I don't think Jim's work is a not-invented-here reaction, but a genuine difference of opinion. I tend to agree that the 2-3% figure is a genuine reflection of the actual proportions, in part because it's around the number that seems to reflect opinion amongst researchers I know, and more generally because humans are peculiar agents and there will always be a tail that holds on to an ideology irrespective of objective analysis. Of course such a distribution is probably two-tailed, so there would likely be a similar-sized tail of people who would support the idea of human-caused climate change irrespective of the nature of the objective evidence. That tail of course would be masked in the straight dichotomy of a single value to describe the split.